P.S. 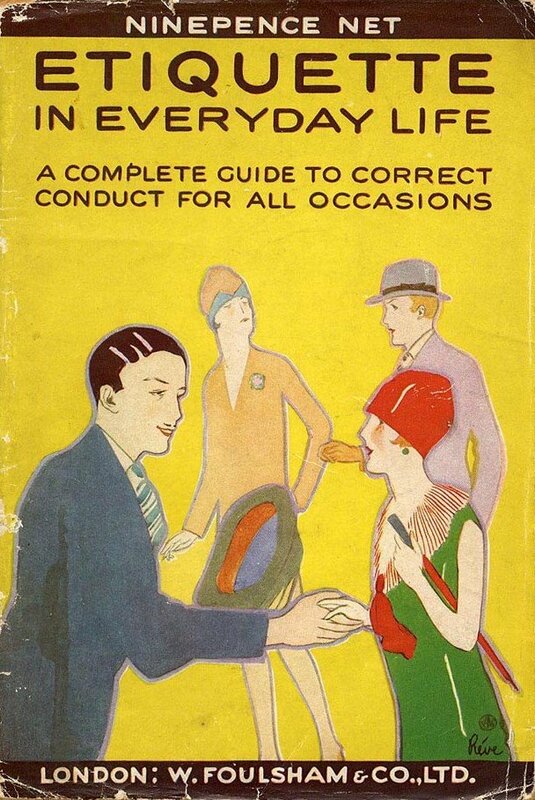 It would be interesting to read that Etiquette book! The times, they have changed, and not all for the better! "A young lady with whom one is courting should always be greeted with a gift of fresh fish." So yesterday I was returning home after a month away at uni (I know in some countries students don't go home very often while they're away studying, but here most students return home every weekend, so a month is a very long time). Anyhow, I was lugging all my bags with books and notes and dirty laundry, loaded like a donkey! At the train station (last stop!) struggling to open the door, until an older lady held it for me, I was so glad she helped me out. It reminded me of how much these small polite gestures actually mean. I could've still been locked up in that station! Holding doors open for people, encumbered or otherwise, is a definite mark of good-manners, as is the saying of 'Thank you!' upon having the door help open (you did say thanks, didn't you??). Sure did. A nice "thank you" and one of my trademark ear-to-ear smiles. That is lovely! It is uplifting to hear the stories of those who still possess a sense of kindness and helpfulness towards strangers!